Pat has spent all of his working life with Competition Motorcycles this is his story. of Pat Slinn's story about a working Life with Competition Motorcycles. 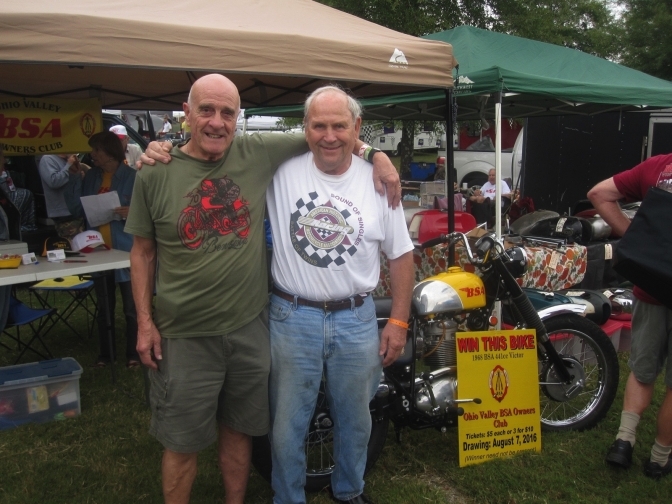 Pat and long time mate Jeff Smith taken at Barbers Meet USA in the first week of October 2015, Both could be named "Mr BSA". And just look at that Victor that could be yours. 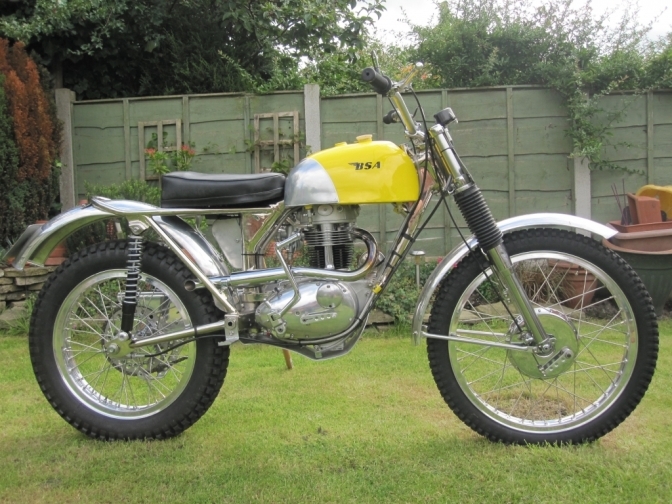 This is Pat's Now Famous BSA C15 Trials Bike, The Forerunner of the BSA "Otter". I have posted to you my "apprentice" story, I have just re read it and find that it is lacking much on the comp shop, I must amend it. Pat. This is what I remember of my days at Small Heath. When I was "posted" as a young apprentice to the Engine development / experimental department in early 1963 the Competition department was a separate department, some time before, I believe that it was Bert Hopwood that had separated the Trials and scrambles machines from everything else because of the mud and stuff that these machines brought into the department. The comp shop was right next door, it was situated between the experimental department and the factory maintenance department, to enter it you had to walk up a slope next to a brick wall, and turn sharp right through two very heavy wooden doors, a lot of the photographs of works trials and scrambles machines were taken with this wall as a background. The area for hosing the bike’s down was also on this slope. The department it’s self was quite gloomy, not much natural light at all, and quite high (due to the height of the roof) although low light’s were hanging above the benches and bike trestles. The department was run by Brian Martin. At one time I believe that the only other full time person in the comp shop was a rather jovial person named Arthur Crawford, he was joined a while later by John Harris, a works trials and scrambler, and then the son (sorry I have forgotten his name) of Vic Doyle who was the Renold chain competition manager. Jeff Smith was always working on his bikes when he was not away racing. There were on occasions the various "works" riders who used to come and collect their machines, people like Arthur Lampkin, and his brother Alan, (Sid), Big John Burton etc. The competition department engine shop was well away from the main comp shop, but still in the same block of buildings, it was a small and cramp place next to the "Old" Gold Star engine test house, virtually hidden away behind the department that removed by chemicals paint from rejected painted components before they were re sprayed. This department was ran by Reg Wilkes who was one of the Gold Star "gurus", he had been building engines for competition bikes for many years. 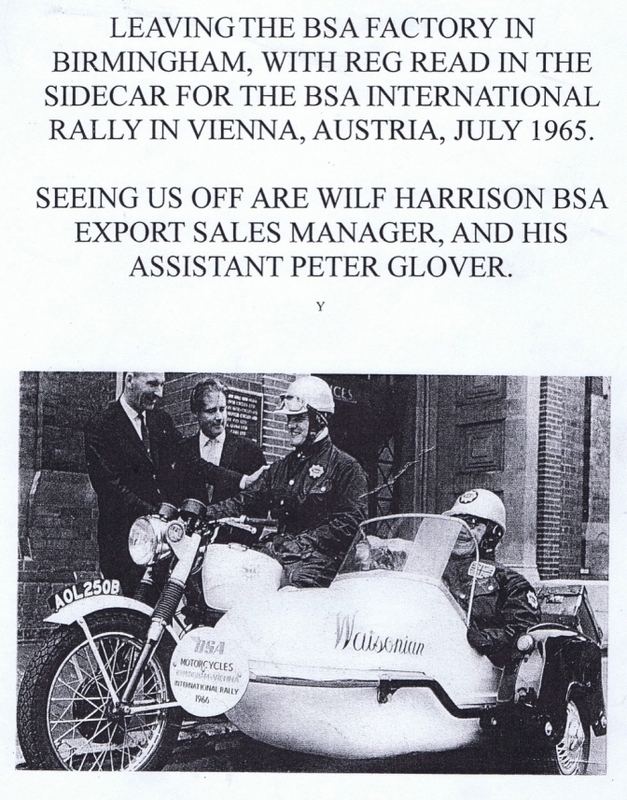 I think that it was in 1963 that Reg left the company and immigrated to Australia, the department was then run by an ex Suzuki GB service engineer John Thickins, John was assisted by Mick Clinch, and later Fred Barlow joined the department. During this period Norman Hanks joined the competition department, and some of the staff from Ariel were found benches in the Development department, including Sammy Miller. The engine shop workload was quite heavy and so the engine development department used to help out with the rebuild of some of the engines. 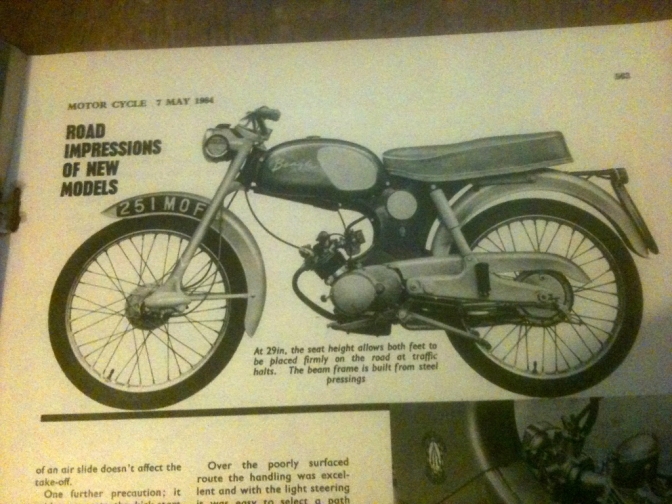 One day a request came in from Brian Martin as to the feasibility of enlarging a 350 cc B40 engine to the maximum reliable size, thus the 420 cc scrambles engine (and later the 441 cc) was born, I can remember the very first prototype 420 cc engine being fired up on the dymometer. I also built the very first 441 cc Pre production Victor engine and fired it up on the dynamometer. One rather positive thing that I remember was that during the preparation of the "works" trials bikes before a trade supported event new tyres were put on to the bikes. Arthur Crawford always used to tell me when this was happening and I was always able to buy from Brian Martin good second hand trials tyres for my own trials bike for a pound or so. Some of the tyres that were taken off the bikes were almost new, and on some you could still see the moulding ridges. 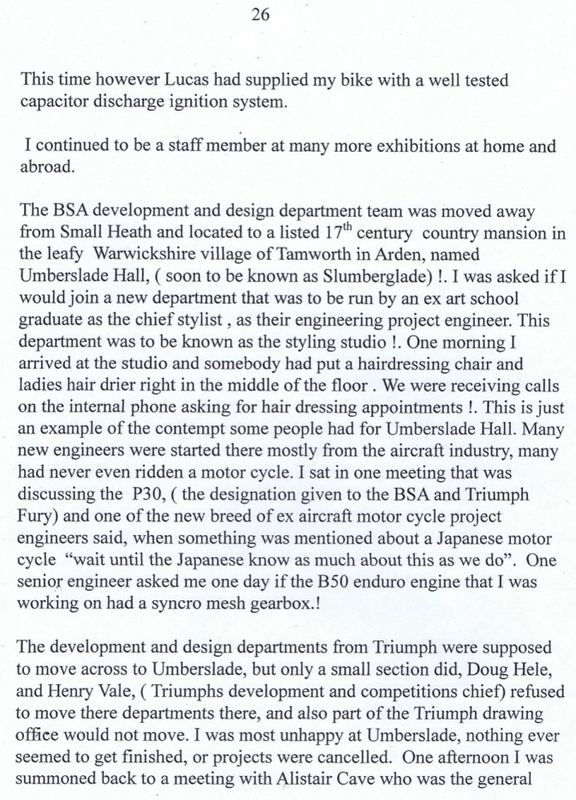 Some time during 1964 the competition engine shop was moved from behind the paint stripping shop, and into a large and freshly decorated and re - equipped department together with the bikes, however the bikes and engines were kept separate from each other behind a dividing screen, this department had plenty of natural light. There was now enough room in this department for all the factory competition machines to be under one roof. Alan Shepherd who was a GP road racer and had recovered from a crash in Japan whilst testing a Honda four cylinder GP machine was appointed under Brian Martin to look after the road racing side of things. One of his first jobs was to oversee the development, building, preparation and testing of a number of 500 cc A50 road racing machines for the annual Daytona 200 mile race in the United States. 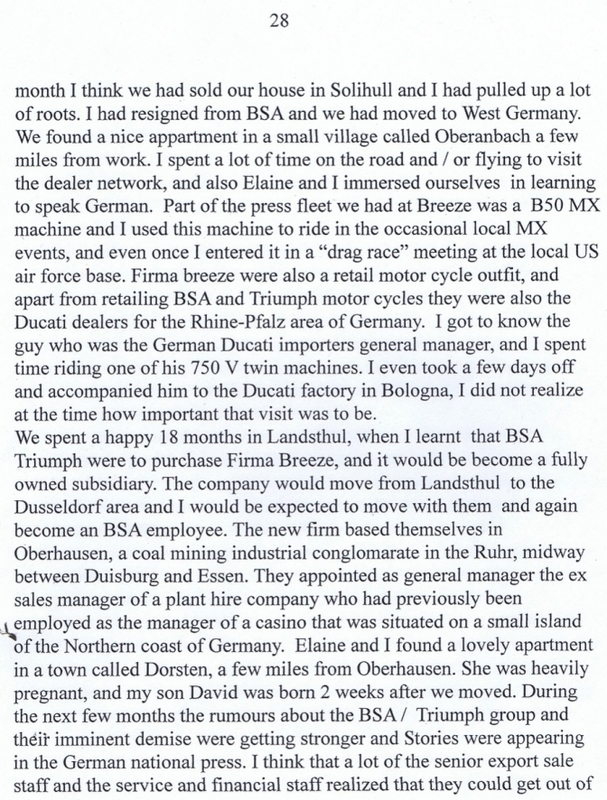 BSA incorporated in the US had sent over a couple of their people to help with the preparation, and to advise on the US specification for these bikes. The building and preparation of these bikes took longer than expected, and a couple of us from the development shop had been drafted in to help, one or two teething problems had shown up during testing at the Motor Industry Research and Development association’s track at Lynley, close to Atherstone in Warwickshire. The evening before the bikes had to be crated up and sent to the US Alan Shepherd was testing one around the BSA test track, unfortunately he had not realized that it was time for the factory to close for the day, and crashed into a barrier that was across the road, Alan was quite badly hurt and was taken to hospital, the bike was extensively damaged and was basically rebuilt over night. During the following year the competition department was moved again, this time to the other end of the factory, close to the forge shop. It was a nice bright department, and this was where most of the development work was carried out on the last of the "works" scramblers, including the Titanium "exercise". Also part of my "general" engineering training whilst a apprentice at BSA was spending time in the pattern making shop and casting prototype castings. BSA management in their infinite wisdom decided to close down the pattern shop and have all casting sourced from outside the factory, another lost skill to an outside world. Apart from sending young apprentices for "long waits" and "left handed screwdrivers", some of us were tricked into using "shrink" rules for general use! Causing great fun amongst the older craftsmen. If anybody tried that practice today it would probably be a violation of something or other, but then it was just education for a young lad, into a working life. 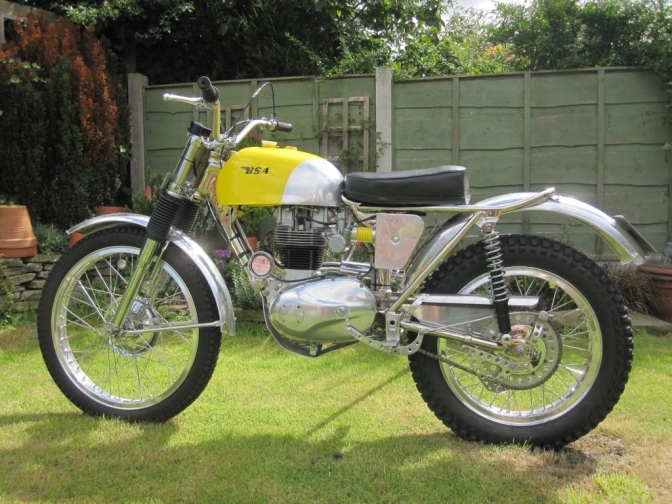 This is the 1966 BSA 441cc Victor bike that Pat won a ISDT Gold Medal on. 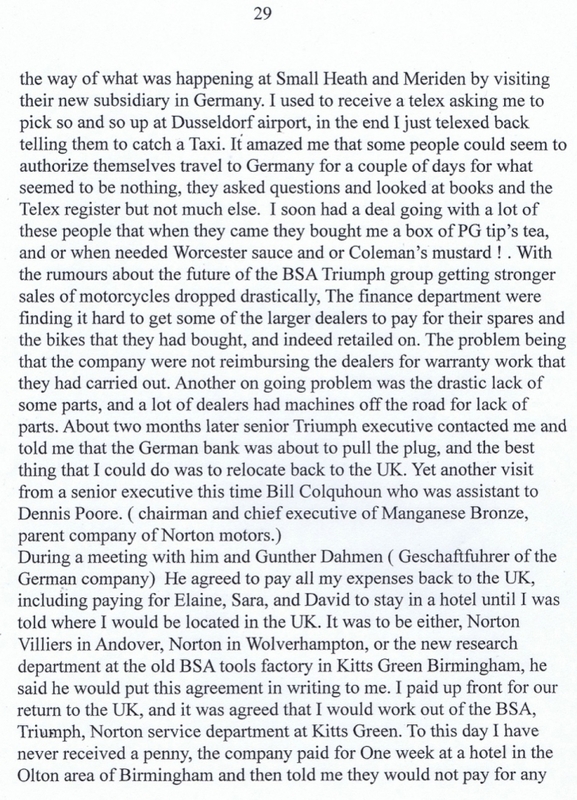 The bike is now owned by Bill Faulkner.who was a supported rider in his time by BSA. And How he has given so much more back to his fellow motorcyclists. Jeff Smith, and Pat, talk over Old times At a Ducati Fest in the USA this October 2014. OK story about this little bike to follow. It is the "BSA Beagle" that was going to save the British Motorcycle industry? Well it actualy could have, with the right "Push" Look at the Honda Cub!!! Just before I carry on with Pats Story. 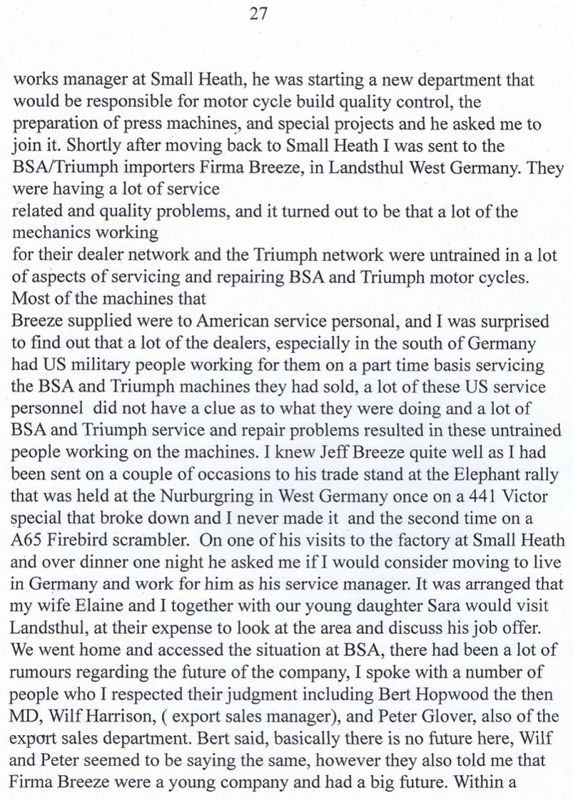 I have this week had contact from Ray Battersby,who was himself involved in the motor and motorcycle industry at the same time has Pat and knew a lot of the same fellows. The first part to the information that Ray has sent me is on the "Mick Mills Legend Frame" page. Here is a follow up to what Ray has sent me before, and I thought it fitted into this page at the moment. Its looking like a page for yourself Ray. I think everybody can see the amount of work you've put in (and the sheer level of detail!) and I am glad it's paying off. I forgot to mention that Scott Ellis was another 'famous' trial rider on the staff at Longbridge when I was there. 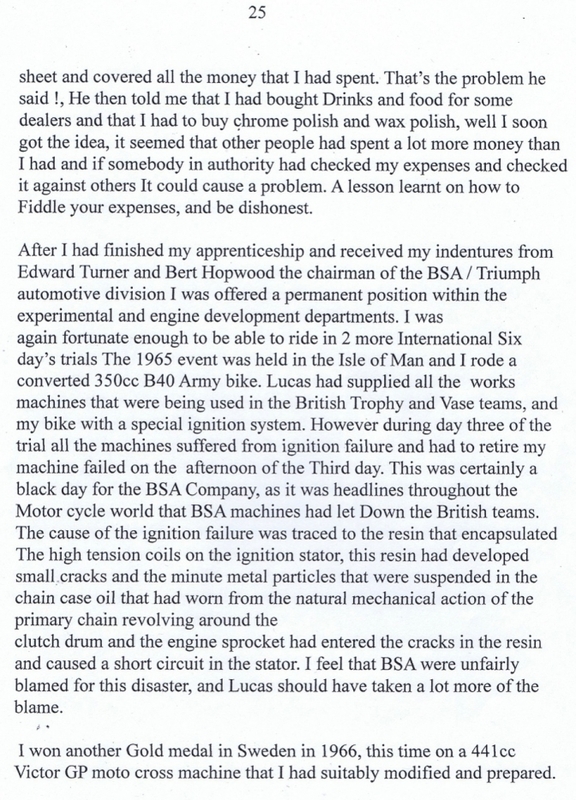 Reg Wilkes was another ex-BSA man who worked the dynos in Engine Development. Reg knew everything about Gold Stars I recall. I note that he gets a mention on one of your pages as being in Australia. I know he was at Longbridge - at least from 1970 to 1976. We had an ex-Ariel guy called Roger Barlow on the Petrol Engine Design section - Selly-Oak was just a couple of miles down the road (I used to pass Selly Oak on the bus going to Technical College)! 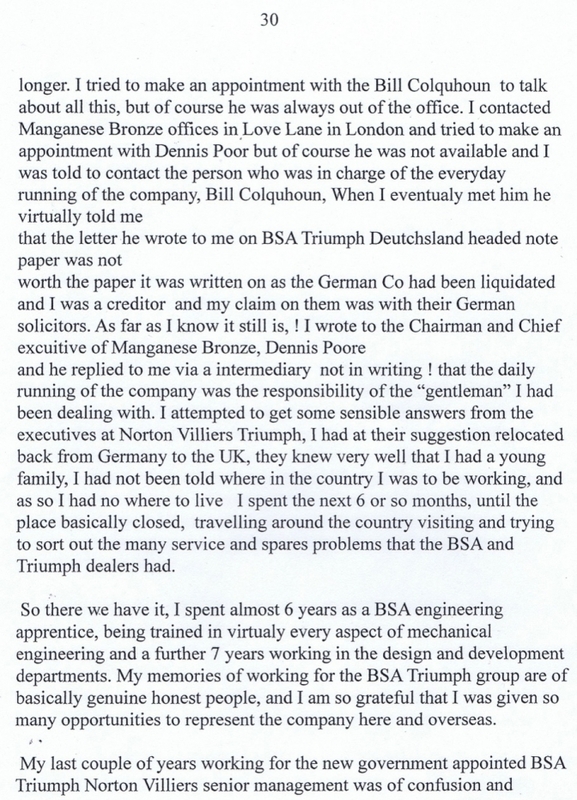 BSA wasn't far away and where else can you get similar jobs locally when the British bike industry had spilt itself all over the floor? And within a few years of joining Heron Suzuki in 1976 Mick Clinch became our Southern Area Technical Manager. 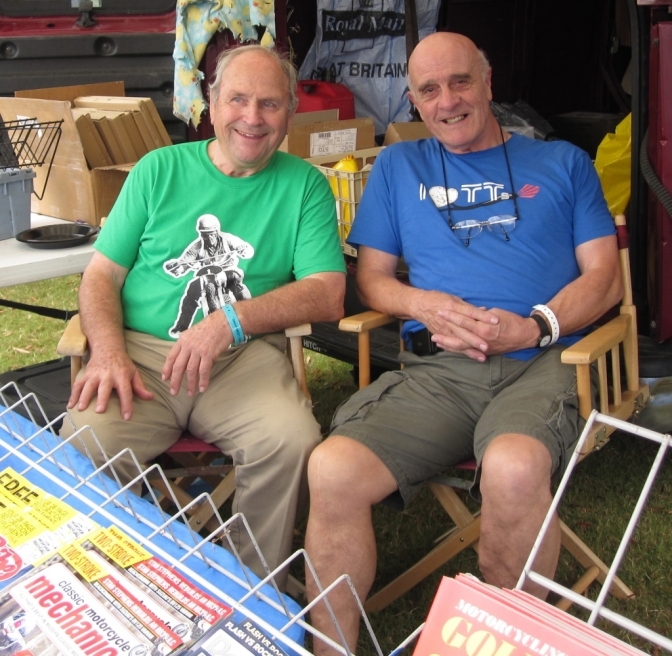 Mick was an ex-BSA Competitions man - and an active trials/mx rider - and I was pleased to have him on the team. And then around 1985(?) Brian Martin joined Heron Suzuki as an Area Sales Manager and what a lovely man he was too! Agh! Them were the days. Thank's Ray I hope you have more to come. "My Apprenticeship Story, "Before During and Beyond". When I can convert the PDF files I will cover all of the book. but for now this is page 23-31. for a taster. I have had to use Photos for the text to tell this Part of Pat's Story has we have trouble converting the format at the moment, but that was not going to stop me from updating the page. I am using the appropriate pages from the complete story on other pages. 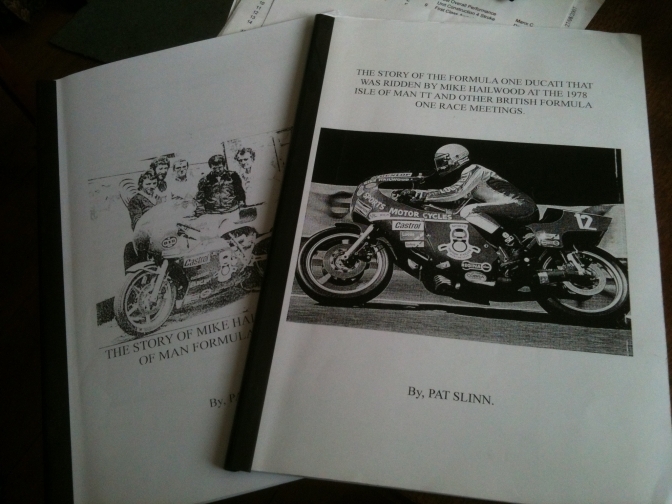 I feel the best way if I can achieve it is to turn the complete stories from Pat into PDFfiles. and then give you a link so that you can down load them. There is not just the "Apprentice" at BSA story but there is also the Formula One Ducati that was ridden by Mike Hailwood at the 1978 TT. And the Story of Mike Hailwoods 1979 IOM formula One Ducati, and this is a very intriguing tale. I Have a collection of Email Tales that Pat has sent me over the years I will when I have time. find the out as they add very well to the above experiences at BSA , so watch this space.